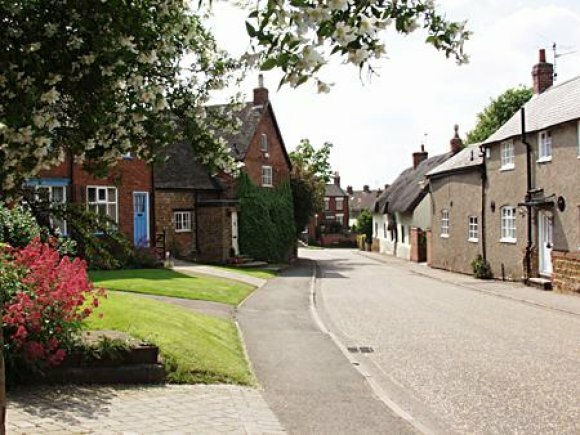 Main Street, south from the A47, is one of the original village roads containing 17th, 18th and 19th century houses. This view is looking south west towards the War Memorial. Houghton on the Hill lies six miles east of Leicester on the main A47 Leicester to Uppingham Road. The first mention of Houghton is in the Domesday Book although it is likely there was a settlement here as early as the Bronze Age. The village, which boasts two public houses, two garages, a combined newsagents/Post Office, a pharmacy, a Co-operative store, a hairdresser and a beauty salon as well as a Norman Parish Church and a nineteenth century Methodist Chapel, had until the Second World War been centred on the half mile long Main Street. The construction of four housing developments from the 1950s to the 1980s, however, saw the population triple in size, rising from 662 at the time of 1951 census to 1,524 at the time of the 2011 census. The Parish Council was established in 1894 with a membership of 5 Councillors and it had the same composition in 1958 although it now has a complement of 7. The Parish Council generally meets every second Thursday of the month at 7.30 p.m. at the Methodist Church Schoolroom in Main Street. Parishioners are welcome to attend and are encouraged to make individual contributions during the informal public participation session.